Mod The Sims - Windowsill with Flowers - Fixed 07 August - REDOWNLOAD! I've fixed a bug with the texture in the *MaryLou_Windowsill_Recolor-Brown-Orange.package*; you can either download the fixed version alone (MaryLou_Windowsill_Recolor-Brown-Orange.rar) or redownload the whole set, that contains the fixed version, as well. First, let me thanks Numenor for his advice and suggestions. If you like to make your houses more beautiful with "realistic" flowers on windowsills, now you can !!! 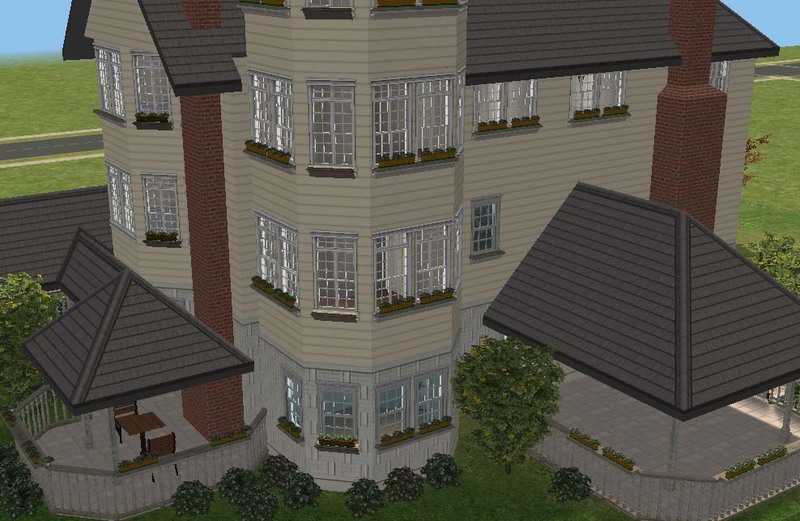 As you have noted, in the game, Maxis' windows aren't at the same height on the wall. So, it's difficult to put objects in front of them, even using the cheat, while assuring a consistent look. The windowsill I made, as you can see in the screenshots, can be applied to all those windows whose height-position allow to have it. It would be meaningless on small and too much high-positioned windows on the wall, or on windows as tall as a wall. The windowsill, 4 meshes, is provided in two sizes: one tile, and two tiles. And it's in two version: with or without vase & flowers. You can put it on diagonal wall without any cheat! It is all recolorable, in 2 different subset: "flowers" and "davanzale" (windowsill + vase), so you can choose your favourite colors. You can choose to install only some elements of this set, but in any case YOU MUST INSTALL the MaryLou_Windowsill_Mesh_Vase.package, contained in the archive ML_Windosills_MESHES.rar , because it's the "Repository" for all the recolors of the entire set. If you don't install it, or delete it from the Downloads, expect a lot of flashing blue windowsills! In the archive ML_Windowsills_MESHES.rar you'll find all the meshes. There are 8 (4 straights and 4 diagonals), though in the catalog you'll see only the 4 straights, the diagonals show up when you put the windowsill on a diagonal wall. 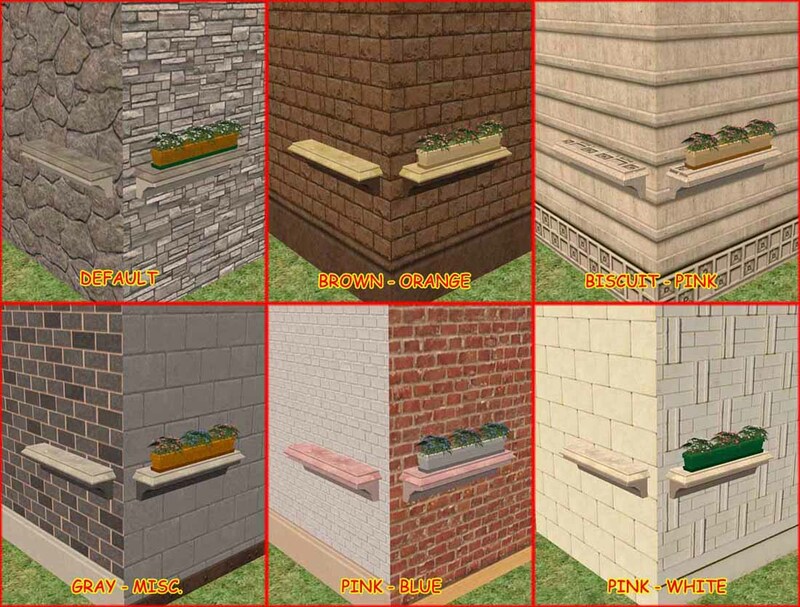 In the archive ML_Windowsills_RECOLORS.rar you'll find 5 custom recolors, as shown in the screenshots. In the game, you can find the windowsills in Buy Mode catalog -> Decorative -> Miscellaneous. You must recolor only the file MaryLou_Windowsill_Mesh_Vase.package. Open the file with Object Workshop in SimPE and select the subset "davanzale" and/or "flowers". The recolors will apply automatically on all the models.You can follow this tutorial. It's really easy to make custom recolors for the windowsill using my default textures as a template. The elements have different number of vertices and faces. Sorry, flowers and foliages need more vertices. All the meshes, the textures and the UVmaps are made by me. The Windowsills can be included in lots posted on free sites (NOT EXCHANGE!!!) no paysite, as long as credits are given to MaryLou and a link to this page is provided. In a screenshot you can see the windowsills on the fances. This is a work in progress. Coming soon. 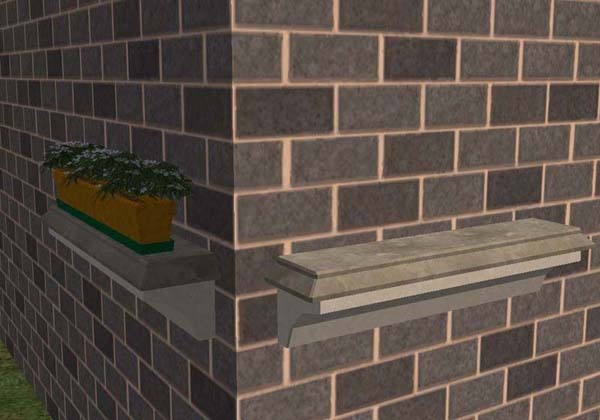 Currently you can apply the windowsills on some Maxis' fances using the cheat Move_Object on.